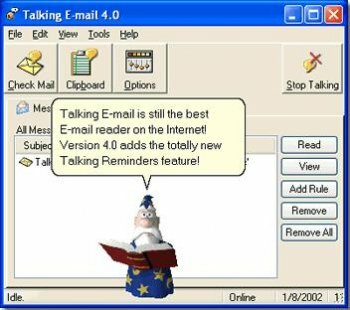 Talking E-mail is a highly customizable E-mail notifier that enables you to listen to your incoming messages as they arrive, via animated characters. It includes a built-in configuration wizard that will have you listening to your E-mail in no time, and requires no special hardware other than a standard sound card. It has many features allowing you to specify which exact information you wish to listen to and how it is going to be presented.